1. Jason Wu Silk-georgette petal coat, The Outnet, £1,557.50. 2. Fantasy Snake print clutch bag, Zara, £79.99. 3. Wine crepe moulded dress, Dorothy Perkins, £40.00. 4. Marc Jacobs round-frame acetate sunglasses, The Outnet, £83.06. 5. Olsen heeled chelsea boot, Stylistpick.com, £39.95. 6. Karyss velvet lace up shoes, Topshop, £58.00. 7. Roberto Cavalli Swarovski crystal earrings, net-a-porter.com, £330. love #1 and #4...great selections! Wow, this is the chicest Valentines day outfit list I've seen so far! All of these are so glamorous! Hey! 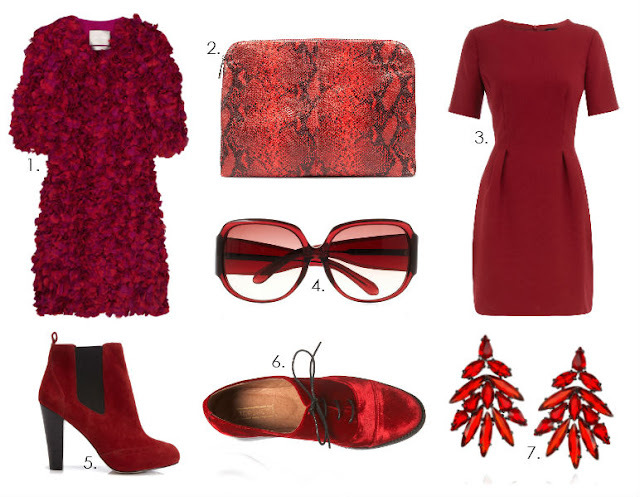 I wanted to thank you for your lovely comment on my blog, maybe we should follow each other, and that red dress is amazing, I love how simple it is and yet it looks lovely! i love this clutch... it looks fabulous! great dress honey , i really love it! Ooh, love the Valentine themed findings! omg i seriously love those two dresse! so romantic! I love the heeled chelsea boots! Great choices for Valentines! Hopefully you can stop by my blog sometime too!